For anyone who likes a bit of bling and sparkle, this is the perfect treatment for you. Using a combination of Shellac polish and glitter, a glitzy look is achieved on the nails. 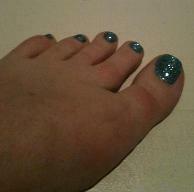 The Rockstar toes can last up to 4-6 weeks with no chipping. For fingers the rockstar look can be used alongside the shellac polish to give a glitter french tip or an all over glitter look. rockstar nails can be removed easily within ten minutes.